We continue to review Wine of Moldova and we think that it’s time to switch to the white wine variety, that we’ve omitted for a while – we’ve decided to get back to the pinot gris wine tonight. 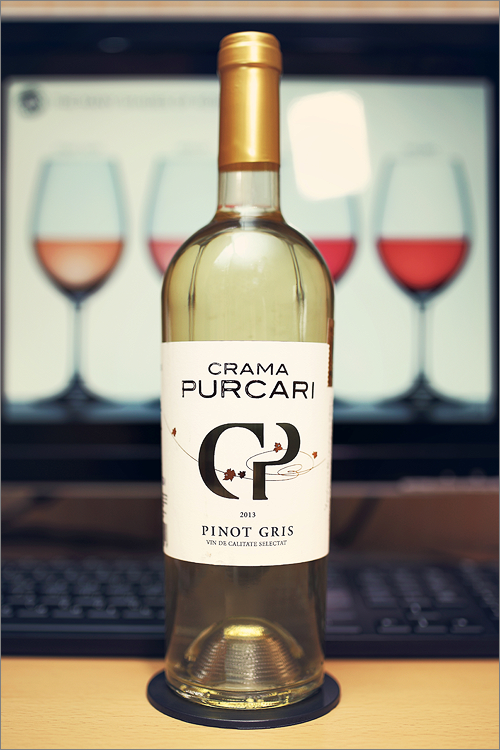 The wine that we’ve chosen for the review is a dark horse, it is a wine that is little known by the regular consumer – Pinot Gris 2013 from Crama Purcari. It is a small and quite new winemaker, but one that already has a reputation of producing fresh and crisp young white wines. So, let’s take a look at what it has to offer. The wine has a bright and pure yellow color, with the rim-color of a translucent green shade. The nose is rich, with quite annoying notes of cork taint. The first nose is sharp and it brings savory and herbaceous notes, mixed with some sweet fruits towards the end: moist wood, green olive, gooseberry, straw grass, limestone and a hint of lemon. The wine is medium dry with some hints of sweetness. It has moderate alcohol, high acidity and medium tannin, which makes it taste green, round and a bit closed. The wine has an overall fair balance – it tastes smooth but tart, wide but fair, with a savory-herbaceous overall profile. The wine has a medium-long finish, with a balanced, bitter-zesty aftertaste. It is not as pleasant or refreshing as expected. This is definitely a good Wine of Moldova and the overall rating says the same, with 83.5 points scored it is right there, among the best wines we’ve tasted so far. Please click on the chart icon on the left in order to get to the wine rating page, where you can find all the wines we’ve tasted to date. Last but not least, we would like to highlight the real potential of small winemakers from Moldova, who push really hard to come out on the market with a wine that could stand tall and proud before the pretentious consumer, but, at the same time, with a wine that will have it’s own identity. This wine was meant to be uncorked in the first 6 months after bottling, as it does not have the aging potential of a classic pinot gris, but let’s make some amends here – this is the first cameo of this new winemaker and the wine we’ve reviewed tonight was affected by cork taint (TCA), which diminished the overall rating. As a conclusion, we can only wish our readers to keep calm and drink Wine of Moldova, because it’s worth it.